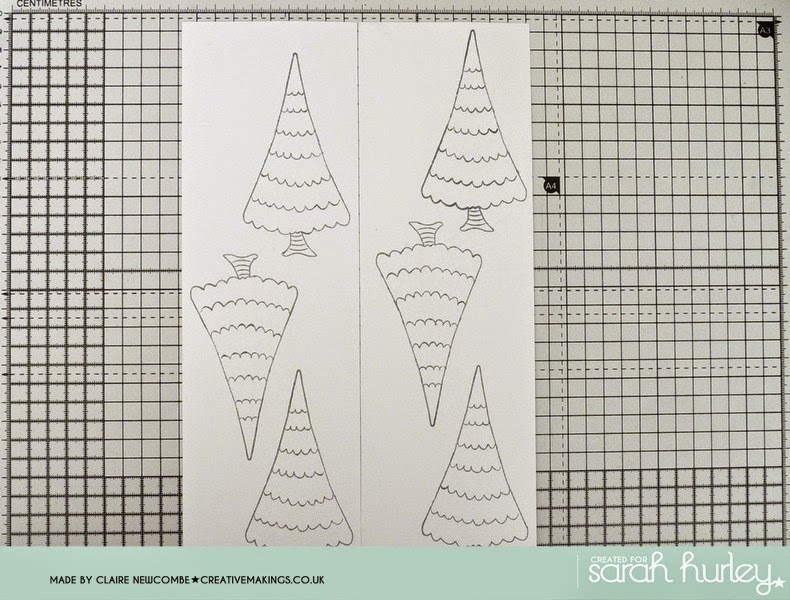 Good Morning from me Claire N.
I'm joining you this morning to share how go about batch making my Christmas cards. The key thing, I think is to find a design that is easily put together, and allows you to alter the colour combination without having to re think the whole design. 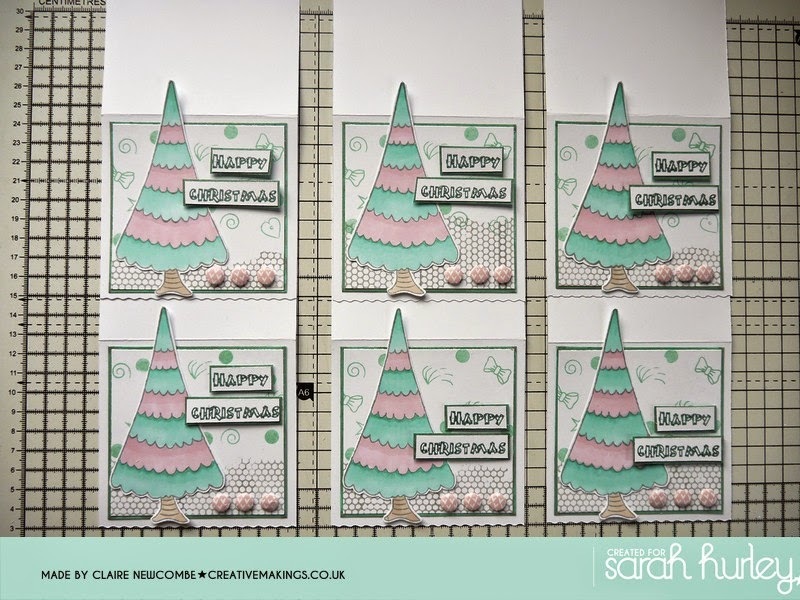 I have used a stamp set designed by Jaine Drake last year, the tree is perfect to colour in your chose scheme this year. I don't know about you but I don't always have enough pre made card blanks to hand, so to make this set of cards (including the layers and trees, I used two and a half 12 x 12 inch sheets of white card stock). Of course this leaves you short of envelopes too, but to make posting easier and economical, when opened out flat, it will fit in a standard DL white office envelope (and the top of the tree will stay protected). Here is the finished card, followed by the a quick set of instructions to make 6 cards. 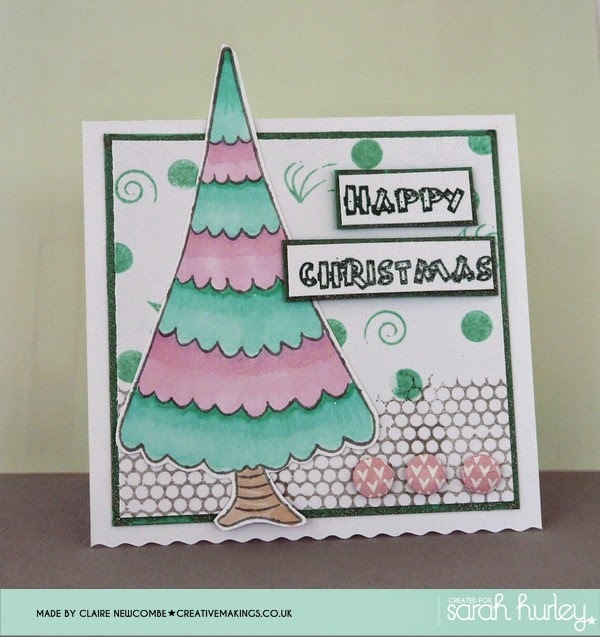 The Christmas tree extending above the card makes this little 4 inch square card stand out from the crowd. You can easily alter the colours the tree is coloured for a different look or add a bit of sparkle here and there. 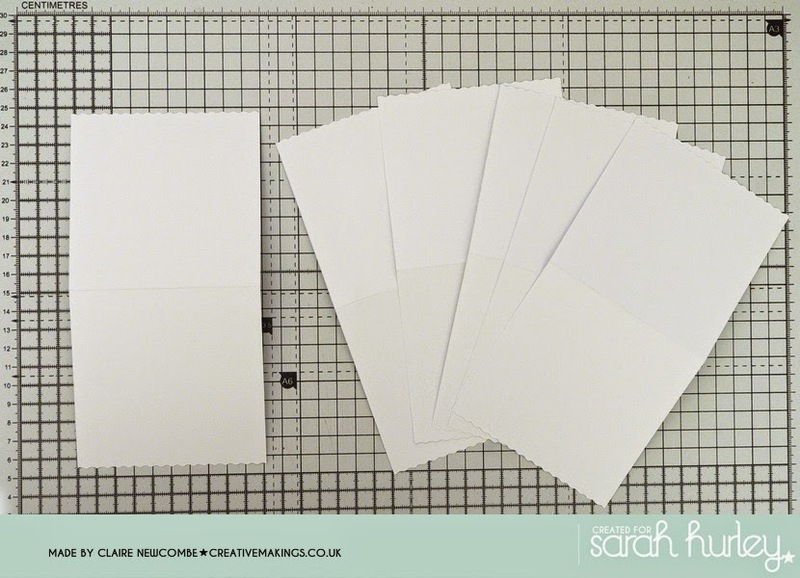 2) Create your card blanks 7.5 in x 4 in, score the crease line at the half way point and deckle cut the two free standing edges. 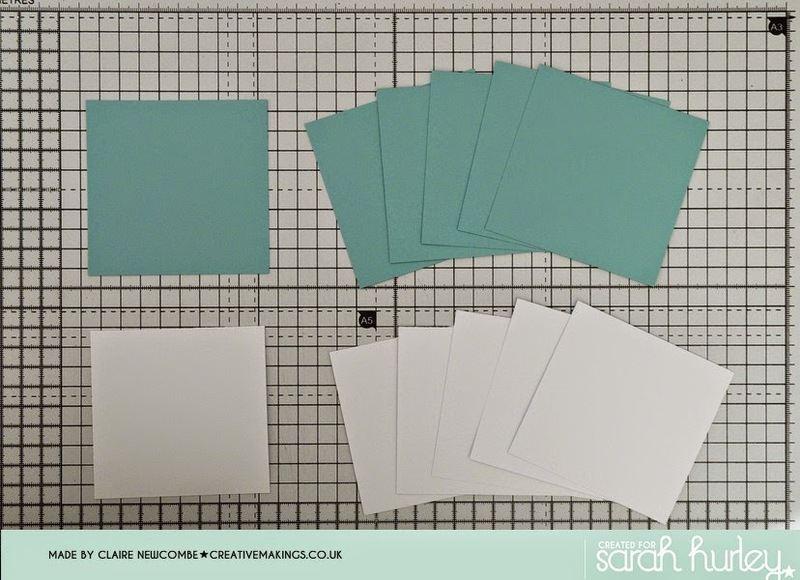 3) Cut the mats and layers in your coordinating colours. The coloured layer measures 3 6/8 in x 3.5 in and the white layer measure 3.5 in x 3 3/8 inch. 4) Here are the components collected together ready for assembly. a - I have stamped 6 sets of sentiments from Jaine's stamp set and layered them also onto coordinating card. b - I stamped a snow scene at the bottom of the white layer in grey ink, and then stamped then stamped the embellishments form the stamp set to decorate the background. 5) With everything collected together, assembly is straightforward, and fun. Like a production line it makes all the prep before so worth while, and you can see your cards come to life very quickly. 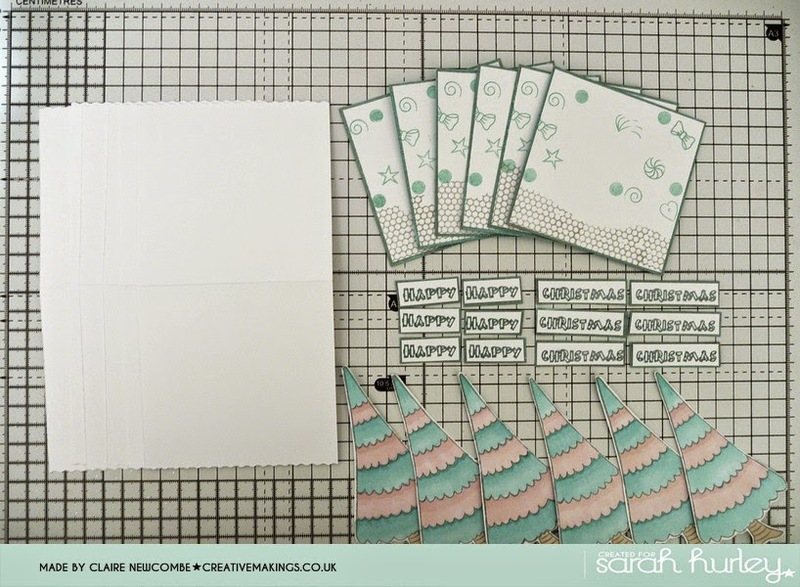 I am probably miles behind most of you when it comes to making and organising Christmas card, I have to admit that it takes me a good while to get going then it ends up a mad rush, but if I organise myself with a sweet little card like this I can usually catch up. Thanks for joining me and good luck with your Christmas creating. Remember to join us from Monday 1st December when we we will kicking off an exciting festive series of blog posts, to build the excitement daily as we head toward the big day. I love the batch of cards especially in those colours. This time of year its always good to find quick ways of making up batches. Great tutorial.